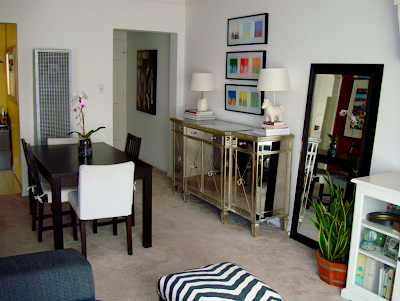 One of my fave small space solutions is to rethink how a room can be used. It's your space and you use it for your own needs. I've spoke before about how it's all about the form + function in your own small space. In our old small space, we turned our small eat-in-kitchen into an office and moved the dining table into our narrow rectangular main room. By rethinking the way the rooms are used, we created 4 defined spaces - a kitchen, a dedicated work space, a dining room and a family room. 3 Responses to "REVISITING....Multi-Tasking Rooms"
gotta love elfa! that's what we have used for the past several years.. moving it from one location to the next [military family].. so versatile! 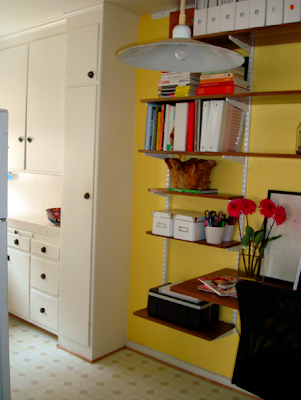 i adore this kitchen & am thinking about copying for my office-thanks for your beautiful blog!